This EMG device is a 2+1 channel wireless electrophysiological amplifier with 2 bipolar input channels and 1 trigger input channel. It has a 24 bit sampling resolution, maximizing its measurement accuracy. 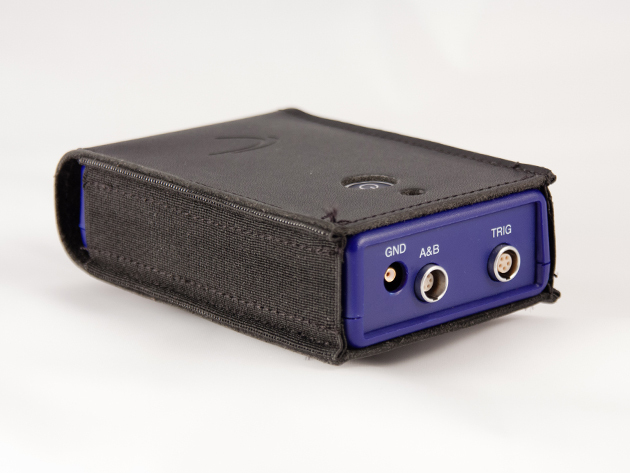 This device delivers clean EMG signals with strong artifact suppression. It also filters the data by using a software that incorporates no hardware filters other than anti-aliasing, so that the raw data is always available and quick recovery is ensured. The EMG device transmits its data directly to a PC or PDA via Bluetooth®, thus optimizing the user’s mobility during the measurement. This device can be carried in a pouch on the subject’s belt and is powered by two AA batteries.